Jesus said in Luke 20:25, "..Render therefore unto Caesar the things which be Caesar's, and unto God the things which be God's." 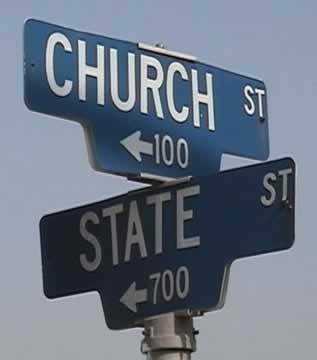 Just about every preacher on this earth uses that passage and a few others to confirm we must keep the church separate from the politics and corruption of government and those that teach prophecy know that the USA is actually the second beast of Revelation and especially evil, therefore clearly not a safe government for pastors to ever join in legal binding contracts with. The purity of the church should never mingle with the worldliness of men who have a bloodlust for power over their fellowmen. As we know, the USA was founded on biblical principles. Our forefathers knew of the evil fruits of Roman Catholicism and how its Church and State coupling allowed the Popes absolute power which fostered absolute corruption to the point hundreds of millions of Christians were tortured and killed by the Vatican as well as the State that followed the orders of their Lord god the Pope, who then forced their Pagan religion upon all using terrorist tactics on those poor souls that feared the stake and the rack of the Vatican's Inquisition. And so, many obedient Christians with the means to do so fled with their families to form a new nation under God as was prophesied right here in America. But as was also prophesied Satan would use the Vatican to eventually infiltrate the nation's leaders as well as the churches so as to get the nation to eventually move the church pastors into the arms of the state in direct opposition of the command of Jesus Christ; who of course was Rome's main target and enemy as per the prophetic Word. And as was also prophesied regarding the preachers of filthy lucre, all Satan had to do was convince the church leaders they could make more money at tax time if they joined their churches with the government that prophecy declared will be the first nation on earth to enforce the mark of the Roman Catholic beast. Now that the end times draw to a close, we see Satan has moved all the churches, including the SDA church, to disobey Jesus Christ our Lord who promised Heaven sent blessings if the churches stayed obedient and kept the church and state separate. As expected the wolves in leadership and on the pulpits chose to obey the government of the second beast who promised them cold hard cash if they forfeited their allegiance to Christ and signed onto the long prophesied 501c3 contract that was purposely designed to join their churches and ministries with the State, thereby fulfilling the prophecy that declared they would create an image to church and state structure of the beast in Rome. All that being said; I have a question to ask of the dear SDA people who still love the Lord Jesus Christ. Do you think your pastors need to step down? Do you finally see what the obedient people of God that left your church see? There is no getting around what Jesus meant when He said "Render therefore unto Caesar the things which be Caesar's, and unto God the things which be God's." And there's no getting around the fact that every SDA pastor decided to only render onto Caesar because Caesar offered them cash. And so every SDA child of God needs to make a decision. Do you follow the Lamb withersoever He goeth? Or do you follow the pastors who follow the cash withersoever it goeth? Which do you see is the better choice? Following Christ or joining hands with those that deny Christ? 2 Corinthians 6:14 clearly says that the Lord's precious and obedient bride must "Be ye not unequally yoked together with unbelievers: for what fellowship hath righteousness with unrighteousness? and what communion hath light with darkness?" The SDA leaders and pastors do not believe or even obey Jesus Christ as His bride does. For if they did they never would have signed that contract with the prophesied second beast of Revelation in the first place. Anyone can preach previously defined Scripture and echo the messages of the pioneers of old to look good on pulpits to keep those that don't read Bibles in the pews. And so I implore those that do trust the Word of God to obey the Lord you love and don't let the wolves double-cross you into staying in sin. Preaching mesmerizing sermons and displaying the riches of this sin sick world does not make for a trustworthy man of God. The basic reality here is; these pastors desire the money gained via the 501c3 contract more than the promised blessings of the Lord you love. Unto them James 4:4 clearly says, "Ye adulterers and adulteresses, know ye not that the friendship of the world is enmity with God? whosoever therefore will be a friend of the world is the enemy of God." So ask yourself this question brothers and sisters. Who do you trust more? The Lord that wrote the Bible, or those false preachers that ignore the Bible He wrote?